Guilds of Ravnica has arrived and the world of EDH is giddy with delight. Ravnica themed Commander Decks got a buff. Five color commander decks got more toys for Maze’s End sub-strategies. Shockland reprints make optimization of mana bases a bit more budget friendly. And of course, stating the obvious, grave yard shenanigans have yet again gotten a big thumbs up from Wizards of the Coast. So let's dive right into my Favorite Big Wins for the EDH Format with Guilds of Ravnica. It’s cheeky but the Maze’s End alternate win condition has always been a favorite subplot for me in five color commander decks, and I’m just so happy that we get more support for "Gates Matter" strategies. I love how Gateway Plaza gives us an 11th gate forcing our opponents to waste an extra land kill spell on what is otherwise a suboptimal land type. 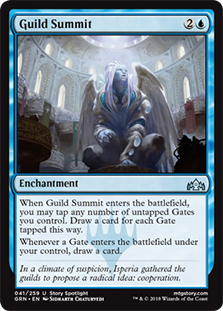 I like how Guild Summit can yield card draw value in the early and late game. It also warms my heart to imagine cards like Sliver Hivelord running around the table wielding a Glaive of the Guildpact. Silly as the strategy may seem, it still keeps your opponents on their toes. Of all the fantastic Izzet cards in this expansion, I’m personally most drawn to Firemind’s Research for its time bomb potential and card draw utility. It’s an easy auto-include for Mizzix of the Izmagnus or Melek, Izzet Paragon decks and will love to synergize with Isochron Scepter, Omnispell Adept and Bosium Strip. 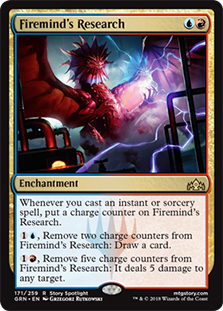 I’m looking forward to hearing stories of someone getting domed out by Firemind’s Research after their opponent pulled off some ridiculous Thousand-Year Storm/Omniscience combo. It will be fun times for all I’m sure. Tajic literally and figuratively brings hot fire to the game. His ability to prevent all noncombat damage to other creatures you control lends itself very well to wrath spells like Deafening Clarion, Anger of the Gods, Slagstorm, Inferno and Blasphemous Act. Being able to burn out the field while keeping our threats alive for combat plays very nicely into aggro strategies. 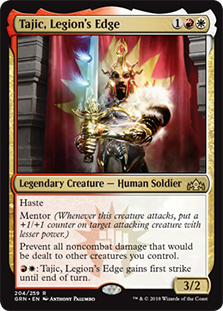 Tajic of course calls for assistance from cards like Darksteel Plate and Indestructibility, but these are easy inclusions for aggro strategies where the deck is hinging on the abilities of the commander. When Tajic isn’t leading his own army, I can see the wrath & smash synergy being very useful for decks like Alesha, Who Smiles at Death, Kaalia of the Vast, Jor Kadeen, the Prevailer and Gishath, Sun’s Avatar. I believe Chance for Glory is going surprise the hell out of EDH pods all over the world the first time it gets abused. I say abused because unlike your standard Final Fortune combo with Sundial of the Infinite and Time Stop, Chance for Glory makes major alterations to your board state by making your creatures permanently indestructible. The abuse will happen in the aggro strategies that go wide and wait for an opponent to try and Wrath the field. With the opponent's Wrath on the stack, Chance for Glory will save your team while everyone else’s boards are cleared. THEN… you get to cut in line for the turn sequence and play your “final” turn before someone else who was supposed to go before you. There is massive potential to sneak in wins with wrath heavy metas using this card. Watch out for players holding up 3 CMC in Boros if you’re looking to nuke the board. Speaking of aggro and going wide, let’s take a moment to bask in the absurdity that is Divine Visitation. 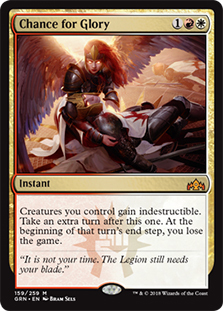 Any deck that runs token shenanigans in white will be running this card because we all want a token army of Serra Angels. This makes Emmara, Soul of the Accord decks super degenerate when paired with the likes of Springleaf Drum, Paradise Mantle and Selesnya Evangel. For hyper absurdity run Doubling Season, Parallel Lives and Anointed Procession. Edgar Markov players will enjoy the irony of running this card. Ghave, Guru of Spores players will love the air power of this card. Anyone playing Snake Basket, Hangarback Walker and Martial Coup will be laughing all the way to the bank. This list goes on. 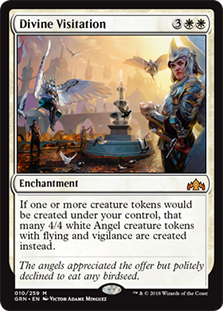 Just be ready for your local tokens player to go full ham with Divine Visitation. This is one of those cards that people may underestimate upon first glance. In Muldrotha, the Gravetide and Tasigur, the Golden Fang decks, I think Underrealm Lich is going to be the equivalent of throwing a propane tank into a bonfire. Every cantrip triples in strength when utilizing this card in a graveyard build. My favorite example of abuse with it is parking it next to a Sylvan Library. 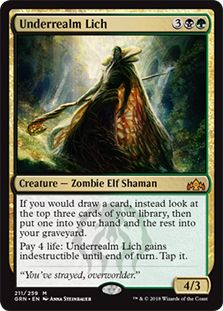 Since we're replacing each instance of drawing a card with the ability of Underrealm Lich, we neither have to put cards back on top of the library or pay 4 life to keep the 2 extra cards. We simply put 3 optimal cards into our hand and feed 6 more to the graveyard. Also, since we are not technically drawing cards this provides insurance against treats like Nekusar, the Mindrazer, Spiteful Visions and Notion Thief. Oh yeah, and it makes itself indestructible. This card is bananas in EDH. This is the card for EDH players who love to blow out games in style. By bludgeoning their opponents to death with their own decks. For argument's sake we’ll park the combo in Esper with Aminatou, the Fateshifter at the helm. The combo is fueled by Altar of the Brood paired with any infinite enter the battlefield (ETB) loop and an infinite mana loop. For the ETB loop I like the to combo of Aminatou, the Fateshifter with Felidar Guardian to infinitely blink each other through the aether and mill everyone with Altar of the Brood. Yes, I know. You can pass turn and probably win but that’s not how Mnemonic Betrayal players roll and Laboratory Maniac is a thing. We follow up with an infinite mana loop using Palinchron paired with either Bubbling Muck or High Tide (conveniently an ETB loop as well) to make all the mana in the world to cast Mnemonic Betrayal and everyone else’s recently milled goodies. Also, before you start talking to me about Magical Christmas Land, we are running this in Esper. This gives us access to all the good tutors to search out combo pieces and a strong pillow fort archetype to keep the table at bay. This deck is for style and ruining friendships after all. Ah, yes. Time to state the obvious. Surveil is easily one of the biggest mechanics to hit Magic in a long time. It’s what you would get if Scry and Entomb had a baby. Now, when it comes to EDH as a whole I don’t believe there will every be enough cards with Surveil to build a strategy around the mechanic exclusively. I do, however, believe Surveil will play a critical supporting role in any graveyard strategy supporting the surveil colors. Doom Whisperer will most definitely be broken, and it will likely involve life gain strategies in an Oloro, Ageless Ascetic deck with a Laboratory Maniac win condition. You can probably expect Blood Operative to find a home in these decks as well. Creatures with an ETB Surveil triggers will likely see abuse through cards like Roaring Primadox, Species Gorger and Erratic Portal. Mission Briefing and Isochron Scepter will become BFFs in graveyard decks and spells matter decks. Muldrotha, the Gravetide will become even more ridiculously efficient than it already is. With that said, it’s important to address a side note. The announcement of Surveil and the vast amount of graveyard support in the last year has likely led to an uptick of mainboard graveyard hate in many EDH metas. 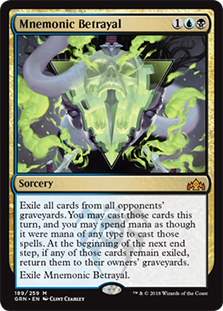 For those who hopped on the graveyard hype train, I imagine this leads to games feeling more like a round of Archenemy. There is salvation for you however, and it lies in Sadistic Sacrament. Unlike Surgical Extraction style cards, Sadistic Sacrament does not limit you to exiling multiple cards of the same name. What’s even better is the option to kick it for 7 generic mana to extract 15 unique cards from an opponent’s library instead of just 3. Steep as 10 CMC may feel, we all know this is not unreasonable in EDH. I also feel Sadistic Sacrament can play a critical role in protecting graveyard strategies from graveyard hate as well as shutting down the biggest threat at the table. There it is. These are my favorite Guilds of Ravnica all stars and their effective card pairings. I hope this article was handy and I was able to spark some brain storming for your EDH brewing delight. If you have any question please feel free to contact me through Twitter @JohnnySlivers. 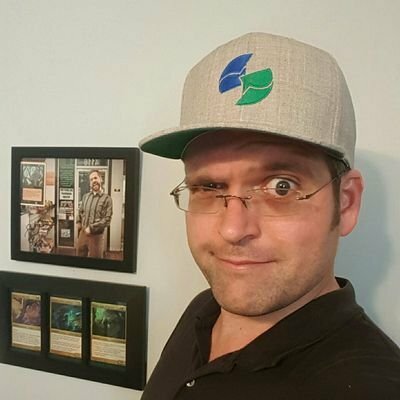 I’m happy to talk EDH shop any time….except when I’m sleeping. Can't help ya there.